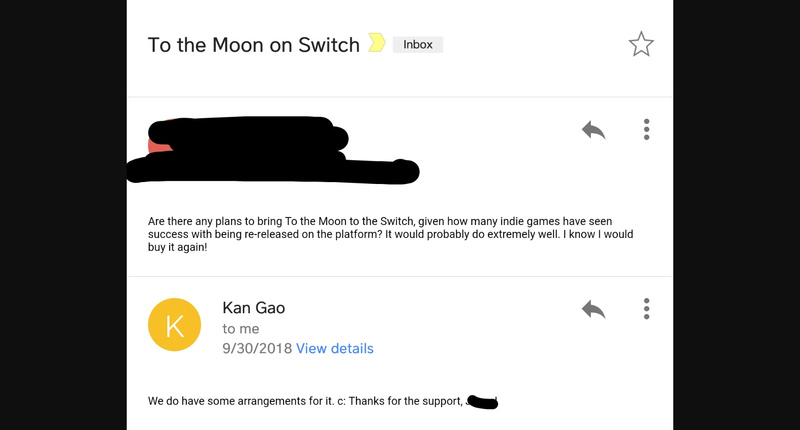 A Reddit user has shared the exciting response he got from Kan Gao, who is the designer, writer, composer, and director of popular game To The Moon. In the exchange between the user and the developer, the user enthusiastically asks whether there are any plans for the game to come to Nintendo Switch. Although rather cryptic, the developer appears to confirm a Switch release (or at least plans for one) in his reply. However, it’s important to bear in mind that an official announcement confirming the port has not yet been made. To The Moon is a Story-Rich indie Adventure game with a plot somewhat reminiscent of popular sci-fi thriller series Black Mirror. Although the game was released for Windows back in 2011, it is still highly regarded. This is evident with ‘overwhelmingly Positive’ reviews on Steam (where the game is often praised for its emotive narrative), and in the fact that the game was also released for MacOS and Linux in 2014, and for Android and iOS in 2017. To The Moon features two doctors who are capable of giving patients on their deathbeds another chance to live, right from the beginning. The only catch is that the experience is only in the patient’s head, and that they will die once they reach the end of that life. The game focuses on an elderly patient named Johnny, and the two doctors’ attempt to fulfill his lifelong dream. As they uncover fragments of his past, it becomes as ‘clear as day’ that Johnny only ever had one real wish; To go ‘To The Moon’.